Research suggests that reducing workload for the solo pilot could enhance general aviation safety. Now MITRE has found a way to do just that with a concept called Digital Copilot. General aviation (GA) has been the tall pole in the aviation safety tent for decades. Despite a variety of efforts to make GA flight safer, that pole has proven stubbornly difficult to shorten. But now The MITRE Corporation believes it has an answer: a set of capabilities that can act as the eyes and voice of a copilot—a unique, digital one. Research shows that single-pilot GA operations have a significantly worse safety record than GA operations performed with a crew (Breiling and Associates, 2010). These differences can be attributed in part to the high workload of single-pilot operations. The majority of GA pilots fly solo, and that is unlikely to change any time soon. These pilots make dozens of decisions during every flight—decisions that require information from many sources. To further complicate matters, pilots are often called upon to make multiple decisions within very compressed periods of time, such as during adverse weather conditions or the landing phase of flight. These situations require the pilot to access information very quickly. That can add up to workload overload. Today, many GA pilots rely on hardcopy charts and books to get the information they require. This includes material such as the checklists they reference during various phases of flight and the radio frequencies used to contact air traffic control facilities. Some pilots have apps capable of accessing much of this information electronically, but they still must physically interact with their devices to search for the requested information and view it on a screen. Any time pilots have to look down at a chart, or take their hands off the controls, it creates a potentially unsafe situation. With these challenges in mind, a group of MITRE engineers with extensive knowledge of GA operations began to talk about better ways to provide pilots with this much-needed information. What if they could come up with a capability that would behave much as a copilot would—something that could respond to spoken commands, look up information, and provide it orally? Something that could intuitively determine what the pilot was trying to do and issue notifications, alerts, and updates as needed? In other words, something that could listen, talk, and—to some extent—"think"? Beyond that, what if they could provide these capabilities via the portable technology many pilots already own and use—their smartphones and tablets? The MITRE team recognized links between this new concept and a few safety risks that were identified by the General Aviation Joint Steering Committee (GAJSC), a public-private partnership that analyzes aviation safety data and develops risk reduction efforts. The engineers presented their idea to a working group of the GAJSC, which enthusiastically endorsed the concept, and the FAA agreed to fund research and development of the capability. In the fall of 2015, MITRE engineers began working on a set of capabilities that came to be known as Digital Copilot. (Video) General aviation (GA) has been the tall pole in the aviation safety tent for decades. Despite a variety of efforts to make GA flight safer, that pole has proven stubbornly difficult to shorten. But now The MITRE Corporation believes it has an answer: a set of capabilities that can act as the eyes and voice of a copilot—a unique, digital one. "We focused on the high single-pilot workload and the lack of a second set of eyes in the cockpit," says project leader Matthew Pollack. "We wanted to build something that would provide pilots with the information they need, when they need it, and in a format that's helpful and not distracting." The team first created a system that can access multiple aviation data sources. They then added a set of prototype algorithms that could use the data to monitor trends, identify safety concerns, and even infer the pilot's intent. "The system actually tries to figure out what you, the pilot, are trying to do," Pollack explains. "It can monitor what's occurring with your flight, and can alert you to safety issues. It can also look up information for you, such as airport data, weather and traffic frequencies, and traffic pattern details." The team then combined these capabilities with an easy-to-use natural speech recognition and feedback system so that pilots can simply ask for the information they need and receive it in an efficient and effective manner. 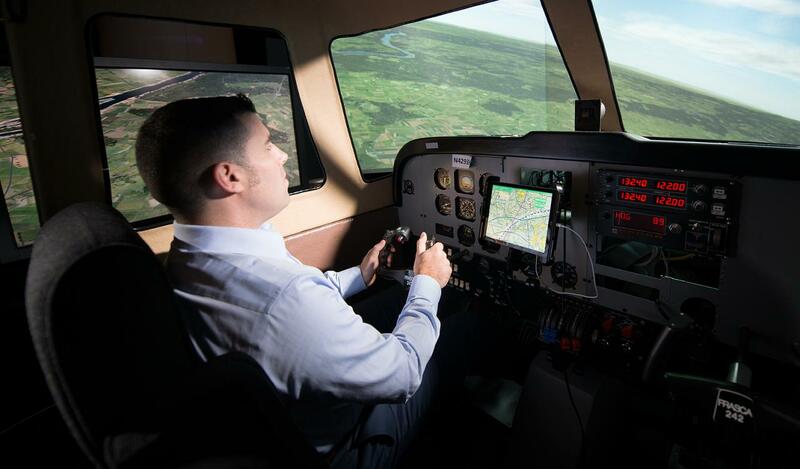 To determine what methods of interaction might work best, the team hosted pilot focus groups and engaged GA pilots in testing the system in simulations and actual flight. "What we found," Pollack says, "is that sometimes the best format is a simple reminder tone. Other times, hearing the information read aloud is best. And sometimes it's helpful to give the pilot the option to either have the information displayed on the screen, read aloud, or both. So we designed Digital Copilot to do all of that." Digital Copilot supports GA pilots throughout the flight process, from pre-flight to landing. For instance, before beginning a flight, pilots can tell Digital Copilot what runway they've been assigned. If they taxi to a different runway, the system can issue an alert. "That can prevent runway incursions and wrong-runway departures," Pollack says. "Expanding that concept to include taxi routes could also prevent inefficiencies in airport operations by keeping pilots from getting lost on the airport surface." During takeoff, Digital Copilot can keep the pilot informed about how much runway remains, just as a human copilot might do. Once in flight, pilots can tell the Digital Copilot what their target altitude is with just a few words. "Now the system can monitor your flight, and if you don't reach the target altitude in a reasonable period of time it will issue a reminder," he says. Digital Copilot is unique in that it determines what the pilot is trying to do. Since overloaded pilots might forget certain checklists, routine tasks, or required reports, Digital Copilot will issue reminders at the right time—automatically. For instance, it can announce important airport information—such as communications frequencies, current weather conditions, and runway information—as the pilot approaches the destination. Pilots may also request customized reminders and other information. For example, they might ask to be reminded to report to air traffic control when they cross a particular point—or "fix"—along the assigned route. They can also ask for a reminder to switch fuel tanks every 30 minutes, or to close the cowl flaps once the aircraft reaches cruise altitude. At any time, the pilot can simply ask Digital Copilot to read aloud any desired information. The system also continually monitors the flight's progress and all relevant data sources so it can alert the pilot to any potential safety issues. For instance, it can issue warnings if the pilot appears to be landing at the wrong airport, heading toward restricted airspace, or approaching a closed runway. It can let the pilot know if the weather at the destination airport has taken a turn for the worse. If the pilot’s approach to the airport does not seem quite right, Digital Copilot will issue a warning—potentially averting a stall during this maneuver, a common cause of accidents in GA flight. There are many other possible applications for this technology, such as airspace awareness, clearance conformance, approach briefing automation, surface safety, and holding pattern and traffic pattern entry. MITRE's testing of Digital Copilot in GA flight operations confirms both its ease of use and its safety benefits. "Now our goal is to get these capabilities into the hands of as many GA pilots as possible, because the more people who have this technology the safer GA flying can become," Pollack notes. To make that vision a reality, MITRE—a not-for-profit working in the public interest—will transfer its research and capabilities to the GA software industry. "We're not trying to compete with anyone," Pollack explains. "Our goal in developing these concepts was to enable developers of the software and hardware that pilots are already using to incorporate these new ideas into their systems. Working together, we can help aviation thrive through increased safety for all pilots." For more information about MITRE's Digital Copilot and the technologies that make it possible, please contact media@mitre.org. For information about licensing Digital Copilot, contact techtransfer@mitre.org.